The BOOM Podcast is an opportunity for author Jeff Yalden to drill down on the principles in his book, BOOM! One Word to Instantly Inspire Action, Deliver Rewards, and Positively Affect Your Life Every Day, while featuring folks from all walks of life who have successfully brought the BOOM into their lives. In Episode 4, Jeff welcomes national award-winning motivational speaker, musician and author Jake Ballentine to the show. 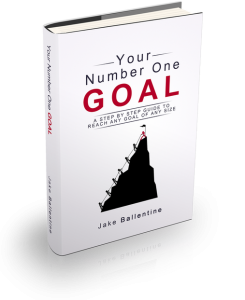 E04: Jake Ballentine, author of YOUR #1 GOAL and professional speaker and Podcaster is LIVE today on the latest BOOM Podcast at 1PM EST. Jake spoke to Jeff from Idaho, where he and his wife were spending time with her family after the devastating loss of her father, a man Ballentine treasured not only as father-in-law, but also as a strong mentor. From Los Angeles, Ballentine was a contributing author to Jack Canfield’s Living the Success Principles. He is the host of the Focus on the Good podcast and the author of Your Number One Goal. He has reached more than a quarter of a million people over the past five years with his unique motivational presentations, which include his spoken positive messages and music. Not bad for a guy who was considered learning disabled and didn’t read a book until he was 18. Ballentine says Your Number One Goal is a step-by-step guide to reach any goal of any size, but before getting into the meat-and-potatoes of the book, he started with a story. “There was one point in my life that I was a depressed motivational speaker,” he said, adding that most people would look at him or Yalden and automatically assume that they have got everything figured out. Ballentine’s business was going well, but he said his life was a mess because he simply wasn’t taking care of himself. He was 26 and tipped the scales at 280 pounds. He knew he couldn’t sustain a lifestyle like that, but what really kicked him into gear was when he and his wife were told that they couldn’t have children. “There was a time where I just got so depressed about this because it was something that we always wanted,” he said. It wasn’t long before Ballentine had his Eureka! moment. One of the principles Yalden lays out in BOOM is that life doesn’t happen to us. Life happens for us. This event was the catalyst for change. Ballentine said he suddenly had a why that was so strong that he could push past any excuse. He transformed his life, his health and fitness – and dropped 60 pounds. Eight weeks ago, he and his wife had their first child, Jacob Oliver Ballentine, Jr. In this episode of The BOOM Podcast, Ballentine and Yalden run the gamut – from how to get motivated and stay motivated – and starting with the end in mind. They discuss the value of breaking goals down into manageable chunks. They talk about the value of purpose – and the power of why. “You’ve got to figure out where you want to be a year from now – five years from now – and then narrow that down to where [you] want to be in five years to what [you] need to accomplish in a year – the next six months – the next eight weeks – and down to what [you] have to do today,” said Ballentine. To Ballentine – everything must point to a person’s North Star – their vision for the future – while paying attention not to neglect the smaller steps along the path. Yalden said this was another way of saying that people need to figure out how to drop the BOOM in their lives. Ballentine said that, to him, family is everything – and finding balance is key. “I think really the biggest challenge comes down to balance – and I think when any change comes in your life – you have got to figure out the new balance and what is the new normal – how you balance things – and it comes down to figuring out the priorities,” he said. Ballentine also explains what he calls “smart goals,” and warns against vague or half-formed goals. For him, a smart goal need to be MEASURABLE, ATTAINABLE, RELEVANT and TIME-BASED. This episode of The BOOM podcast is chock-full of actionable content. Yalden and Ballentine discuss the necessity of mentors, the magic of asking for help and the inestimable value of continuing education and personal development. “There is not a day that goes by that I am not listening to iTunes/podcasts/Audible books. It’s constant. I consume information constantly. I’ve learned more through these earbuds than I did in the whole four years of college,” he said. The point is – there is so much knowledge out there – and it’s available to everybody – in any format you choose. Yalden said this is part of the BOOM for everybody. “You can make excuses that college is too much money or education takes too long – but education is every single day,” he said. Click HERE to grab a free copy of Your Number One Goal. To subscribe, listen to, or explore to The BOOM Podcast, visit HERE. Get your copy of BOOM! One Word to Instantly Inspire Action, Deliver Rewards, and Positively Affect Your Life Every Day. 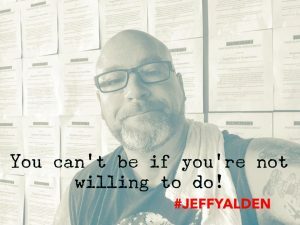 Find out everything about Jeff Yalden HERE. JOIN the BOOM Nation Facebook Community. Roger Yale is a longtime contributor to McClatchy Newspapers’ The Sun News in Myrtle Beach, South Carolina, focusing on stories about the people who make the Grand Strand awesome, including teen motivational speaker Jeff Yalden. He was voted Story of the Year winner four times by readers of The Sun News’ sister publication, Weekly Surge. Roger is the parent of adult twins. His son is a United States Marine and his daughter is currently involved in marketing for Broadway productions in New York City. He spent many years as a single father, and he believes that the experience was something to relish – and the bond he forged with his twins remains strong. Roger is also a working musician.